Moree’s Miyay Birray Youth Services has received $3,000 to conduct NAIDOC Week activities in Moree. 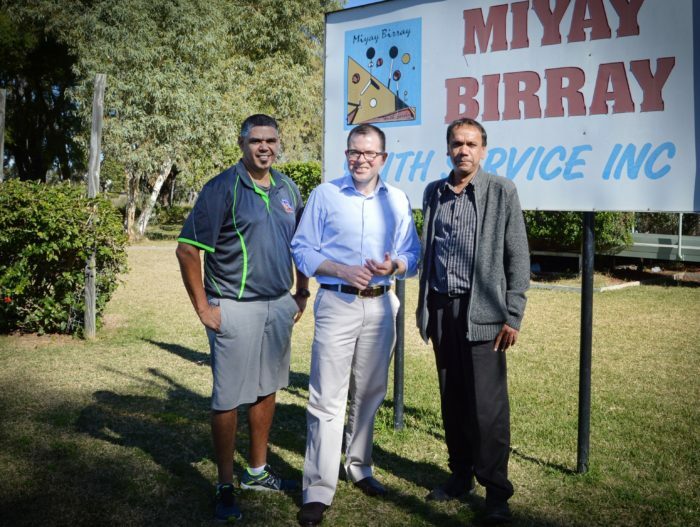 Miyay Birray CEO Darrell Smith, left, Northern Tablelands MP Adam Marshall and manager Steve McIntosh. IN a few days, NAIDOC Week kicks off across the Northern Tablelands, backed by $24,500 in State Government funding, local State MP Adam Marshall announced today. Mr Marshall said the diversity of the celebrations provided something for everyone. “NAIDOC week reminds us that modern Australia has unbroken links with the world’s oldest culture,” Mr Marshall said. This month, DNA sequencing by researchers at Griffith University established beyond doubt that Aborigines were indeed the first people to settle this continent. NAIDOC – National Aborigines and Islanders Day Observance Committee – annually runs a weekly celebration of the history, culture and achievements of Aboriginal and Torres Strait Islander peoples. The 12 events that the NSW Government is sponsoring across the Northern Tablelands have something for everyone.